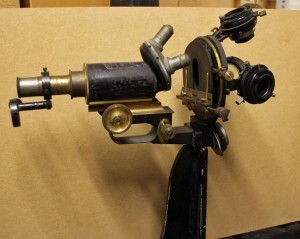 What was this microscope used for? 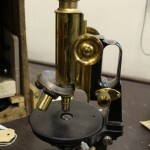 Discovering rare or unusual microscopes has become almost routine since we began packing the collection, but this one has me (and everyone else who has visited) baffled. 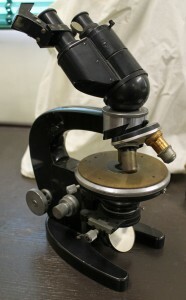 It seems to be a “jug handled” Carl Zeiss Jena microscope from the late 19th/early 20th century. 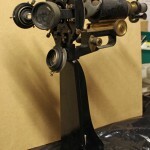 However, it is mounted on its back rather than on a foot (1). 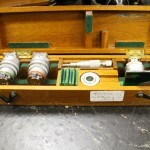 Moreover, in place of the usual single condenser, there’s what seems to be 2 lenses of different strengths and 2 condensers (2), hinged so that any of them can be used to light the preparation (3). 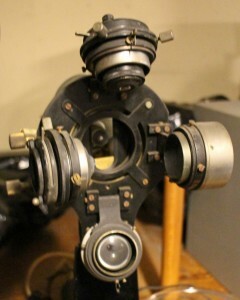 There’s an additional lens which can swing over the usual ocular (4). Has anyone any idea what it was used for? 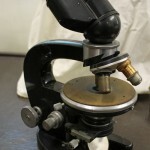 At the moment, sorting out the cupboards before our move has become very exciting as I’ve reached the microscope collection. 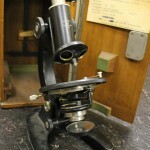 Much of it was stored in the 1950s when the Laboratory of Microbiology moved from its original building, and has rarely been disturbed since then. 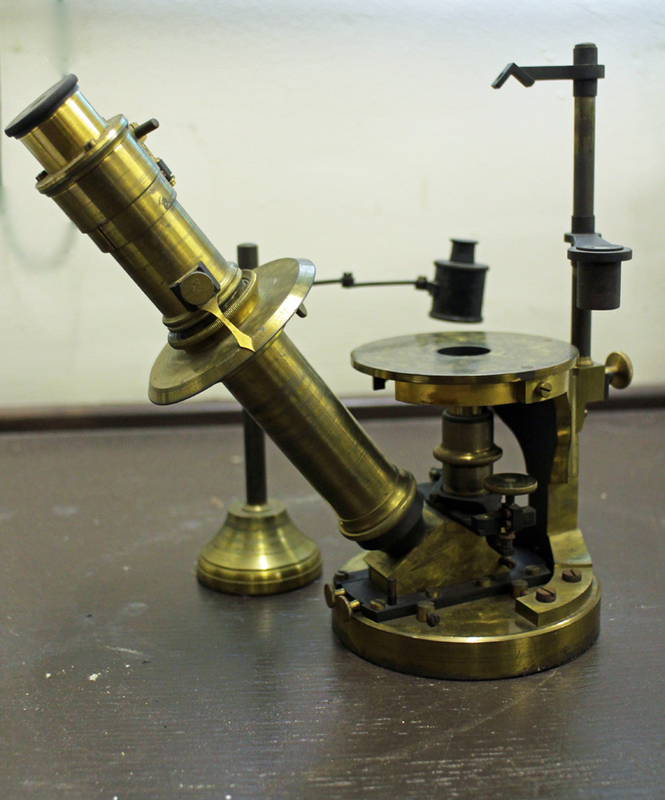 Some of the microscopes date from the late 19th century, and even some of the 20th century ones are more interesting than might be expected. 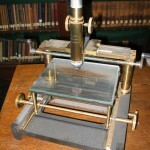 The youngest of the companies represented in our microscope collection is probably the least well-known, especially outside the Netherlands. Founded by Dr Caroline E. (Lili) Bleeker and Gerard Willemse in 1939, Nedoptifa rapidly became known for the high standard of their optical products. 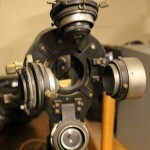 They began with the production of binoculars for the Dutch army, but production was interrupted by WW2. 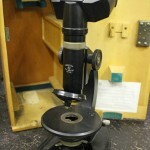 Most of their microscope production seems to have been after 1945, when the “Nedoptifa” name came into use. 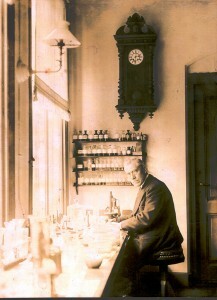 The company cooperated with the Nobel prize-winner, Frits Zernike, in the development of phase contrast microscopy and held his patent on phase contrast microscopes. Bleeker retired at the end of 1963, the company was eventually taken over by a Delft firm and then in 1978 the factory in Zeist was closed. 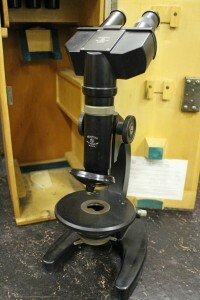 Kluyver’s group seems to have used the basic Nedoptifa microscope for teaching – we have quite a few of them. Most of them have the standard circular stage, but a few are square. 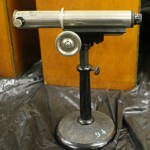 We also have one of their very early binocular microscopes as well as monocular and binocular phase contrast microscopes. 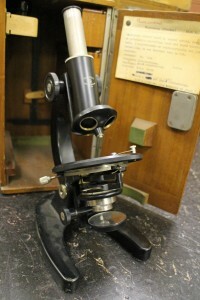 Most of them, with the exception of the binocular phase contrast microscope, seem to have been use in in the laboratory before 1955. 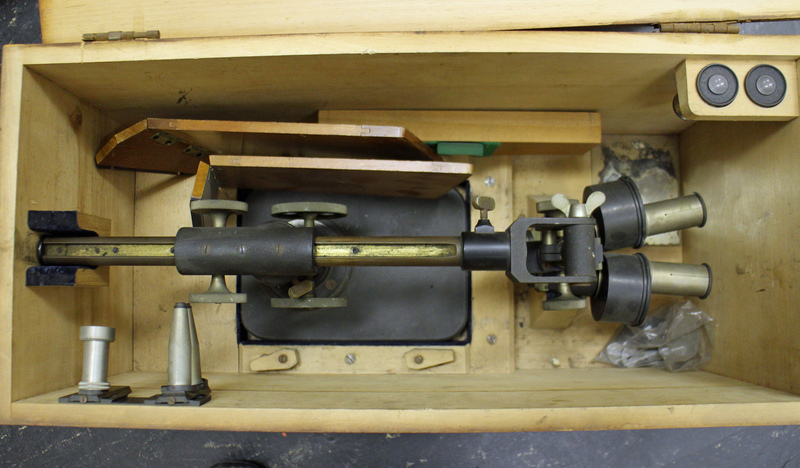 Note added later: Disappointingly, after a visit in mid-June from Peter Paul de Bruyn, an expert on Bleeker microscopes, it seems that the microscopes whose boxes proclaimed them to be phase contrast microscopes do not have the necessary lenses or fittings. They may appear as we complete the packing of the collection, but it’s beginning to look unlikely. 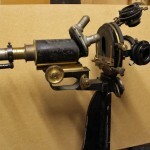 This famous old microscope manufacturer needs no introduction. 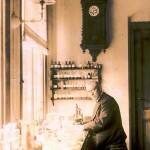 In what is probably our most famous portrait of Prof Beijerinck, he is clearly using one of their “jug handled” microscopes. 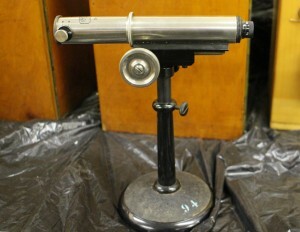 Others in our collection are in the Zeiss catalogues of the late 19th century. 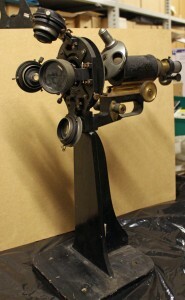 We also have some more unusual examples of their work including a “horizontal microscope” (intended for examining living plants) and a binocular microscope fitted with a prism on the right ocular to aid the drawing of samples. 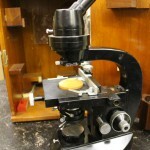 I really shouldn’t have favourites, but I must admit a fondness for the very heavy preparation microscope that turned up in a battered old wooden box on top of a cupboard. 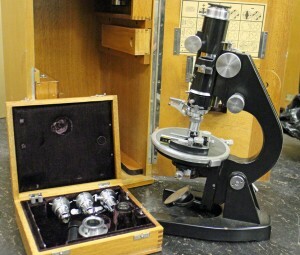 When it is taken out of the box, the eyepieces on the right flip up, giving a forerunner of our modern stereomicroscopes which can be found in the 1902 Carl Zeiss Catalogue. 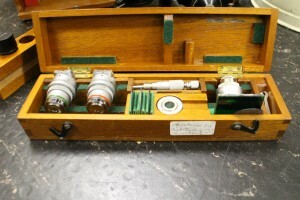 There are 2 sets of lenses and oculars. 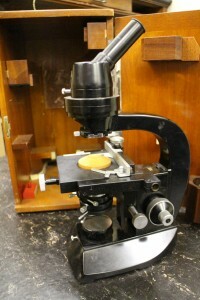 During dissections, the microscope can be moved backwards and forwards along the metal bar. 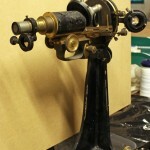 Another famous old company, Leitz seems to have been a favourite with Professor van Iterson. 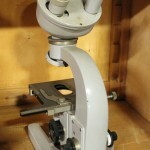 Among the microscopes from this company are a “measuring microscope”, a preparation microscope with wrist supports and the microscope (with an extensive collection of extra attachments) that he used after he retired. 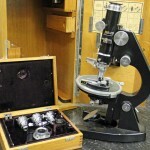 Other microscope makers are mostly represented by single instruments, so I will only show two of the most spectacular. 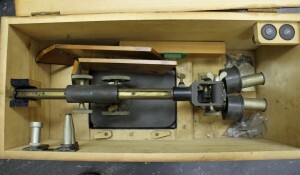 First is the interference microscope made by Cooke, Troughton & Simms from the Van Iterson collection. 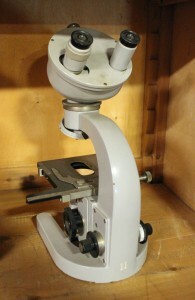 This microscope is accompanied by a set of extra attachments and filters. 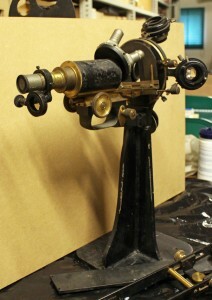 And lastly, one of the most unusual microscopes in our collection, a reversed microscope made by Nachet & Fils of Paris. The sample lies on the stage and can be illuminated from above, with the observer’s light path underneath the stage. 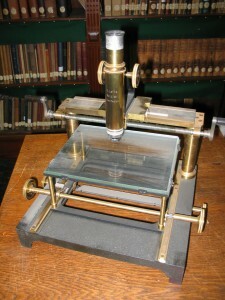 It appears in the 1898 Nachet catalogue. 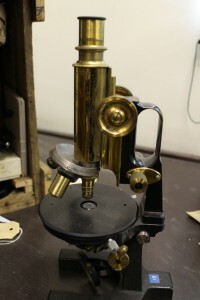 This microscope was given to the collection by Dr and Mrs ten Hoopen, both of whom worked in the Department of Applied Botany before volunteering to help with the Archive and Museum after they retired. 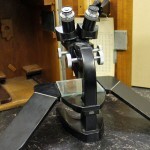 The Delft School of Microbiology Archive owes a huge debt to both of them. Truus undertook two major tasks. First she restored our enormous collection of glass negatives (see the blogpost “Glass negatives galore!”) after they all got damp during asbestos removal in the attic where they were stored. She then went on to research and catalogue our collections of original and printed botanic and microbiological wall charts (see blogposts “The art of Henriette Beijerinck” and “Educational Wall Charts – where are they now?”). 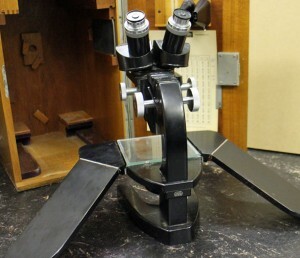 Meanwhile, Hens catalogued the microscopes and other equipment (we have the most amazing range of pH meters, for example) in our collection. Without Truus and Hens ten Hoopen, we would know a lot less about the Collection than we do.